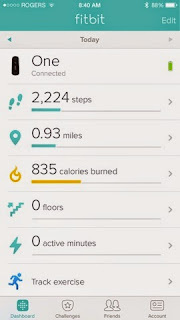 Life With A Love Bug: Fitbit one first day review! 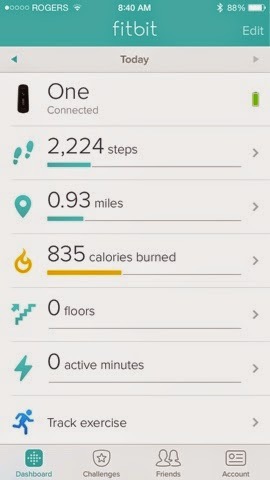 So basically everything you see in the image is what you get with the Fitbit one. You obviously get the Fitbit one itself you get the Fitbit clip which I got in Burgundy, The sleep wrist strap, your charging cord and a wireless sync for your computer. The Fit bit can be worn several different ways you can just have it in your pocket. You can clip it onto your pants or onto your shirt or you can even clip it to your bra which is one thing that they suggest. I decided that I was going to try clipping it to my bra only because I didn't want it to show that I was wearing it while I was at work I wanted it to be discrete. I clipped it to the cup of my bra at first and the clip keeps it pretty secure so I wasn't afraid of it falling off, I realized that doing that made this bulge in my shirt where you could obviously see that I was wearing something so I moved it to the middle of my bra where the cups come together and It was very comfortable secure and discrete. I set my Fitbit One up to sync with my IPhone 6. so anytime I open the app it automatically updates my steps and calories and such and its very easy to read and the app is very easy to use. At this point I love it's simplicity and I forget I'm even wearing it as it is so comfortable and small. I also used it to track my sleep last night which was one thing I was looking forward to with this product because I never know if I'm sleeping well enough I have a really hard time with sleep. I love sleep I just find I never get enough and that could be just because I work to much having 2 jobs and trying to raise a almost 2 year old doesn't really give you much time for this whole sleep thing. So as I said I was looking forward to the sleep monitor. 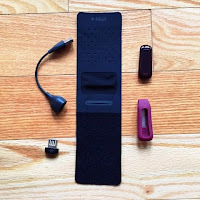 To use the sleep tracker you take your Fitbit One out of the clip casing and slip it into the writst strap you then have to press on the button on the front of your Fitbit One and hold it until the countdown starts. This puts it into sleep mode and will track how much you move around and such. One other thing I like is that it has a silent alarm so instead of having a beeping loud alarm that startles you awake in the morning it vibrates on your wrist waking you up gently. 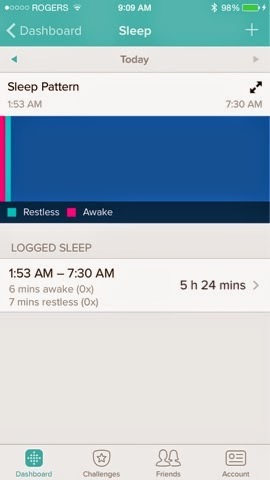 I have to say I was a little skeptical about this thinking that It wasn't going to actually wake me up so I tried it on a day where I wouldn't be in a rush to wake up and I have to say I was surprised it woke me right up at the time I had set it which as you can see from the chart was 7:30. Also you can see from the chart that I didn't get a whole lot of sleep as I only slept 5 hrs and 24min due to the fact that I worked late last night. But you can see that I had a solid sleep after a few minutes of restlessness. So all in all for my first day of use I'm pretty in love with my Fitbit One and will happily continue using it and will recommend it to whoever is looking at something like this. cause it is pretty awesome!